Talk about eating the rainbow – how gorgeous is this dish? 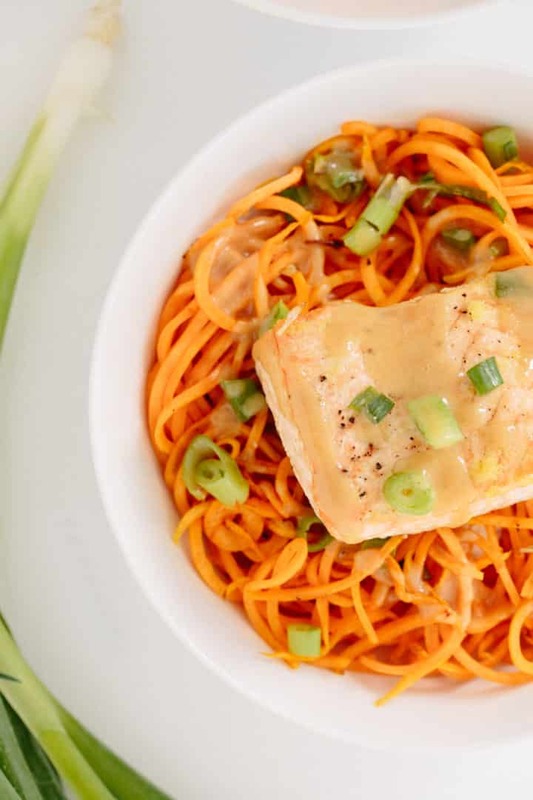 The orange from the sweet potatoes and the pink from the salmon is stunning! It’s kind of like when you get a present that looks too pretty to tear apart. That’s how I feel about this dish. Alas, it’s too good NOT to eat (just like you can’t handle the suspense of what that present is.) So, let’s unwrap this, shall we?! This miso-maple dressing is just sweet enough to carry the sweetness of the potato, while complementing the savoriness of the roasted salmon. When you need a big, hearty bowl of food and don’t know what to make: make this. It’s flavorful, healthy and very filling. 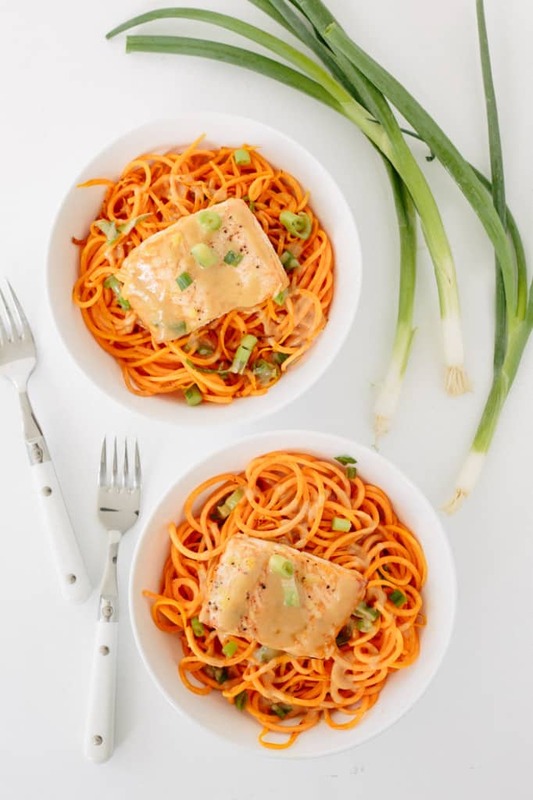 Let’s talk about sweet potato noodles for a second – you’re basically chugging a bottle of Vitamin A and C when you eat them – they’re packed with nutrients. Along the same lines, the salmon provides a lean protein, essential omega-3 fatty acids and the ginger helps boost the immune system. If you’re gluten-free, Paleo or have issues with soy, omit the miso here and replace with tahini. Vegetarian? Top with tofu or lentils! 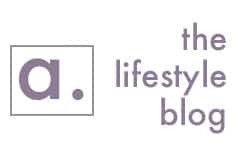 If you subscribe to our newsletter (you should, you get a free Starter Guide just for signing up! 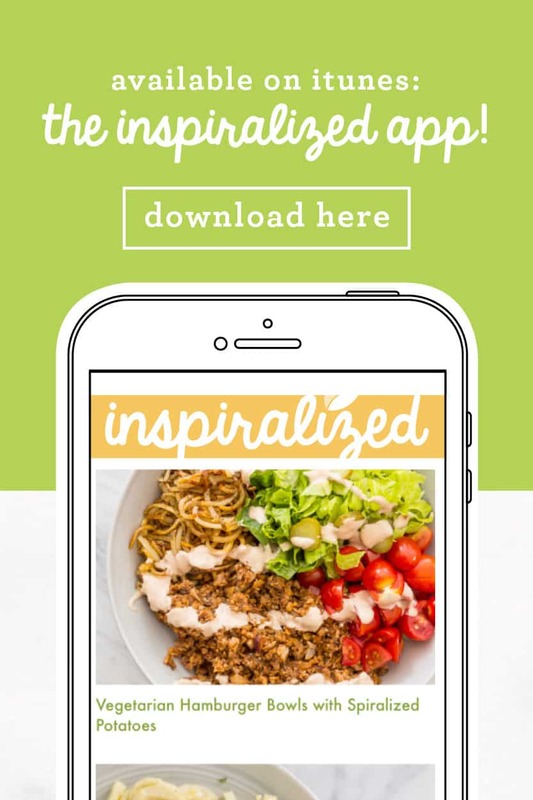 ), you may have seen our announcement on our #makeitinspiralized campaign! 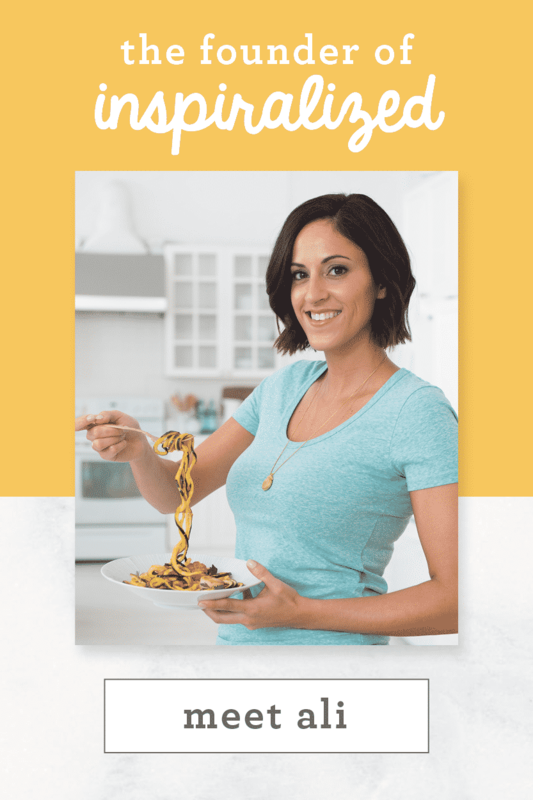 Over time, many of you have expressed that you may not spiralize because you’re “not sure what to make” or you’re just craving your favorite takeout. Well, I am challenging you all to #makeitinspiralized! 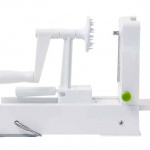 I want YOU to become the recipe creator and get creative with your Inspiralizer! Whether you had a great chopped cucumber salad at lunch or order shrimp lo-mein every Friday night, I challenge you to create an Inspiralized version of something you’ve had before. 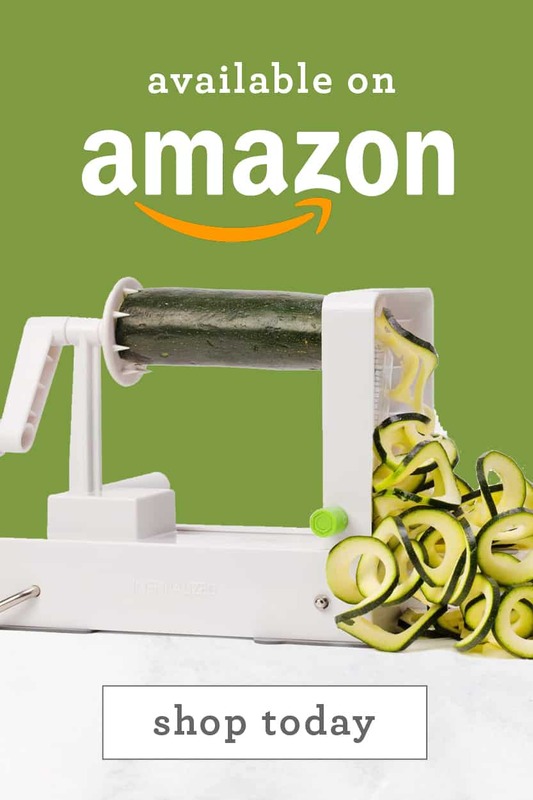 For example, I ate an Israeli Salad earlier this week and decided to spiralize the cucumbers (instead of chopped them, as they originally were). What was left? 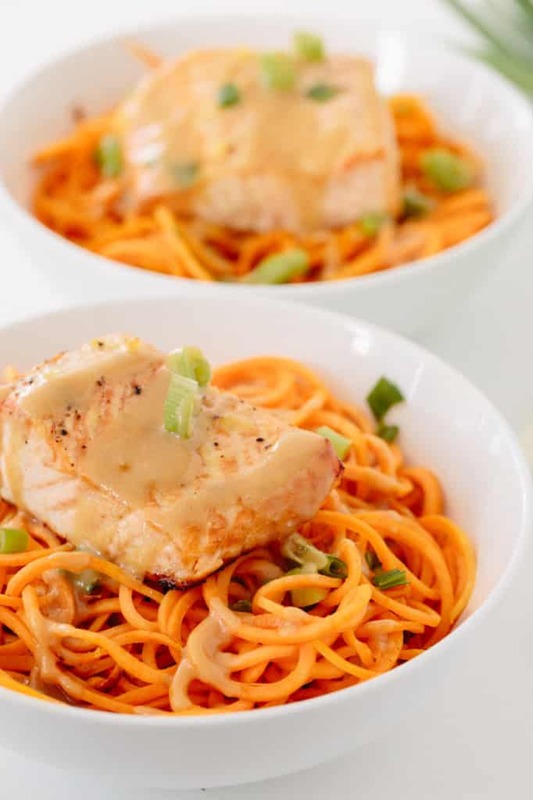 A dish with delicious noodles instead of cubed cucumbers (much more fun and satisfying!) That recipe is coming next week, actually! 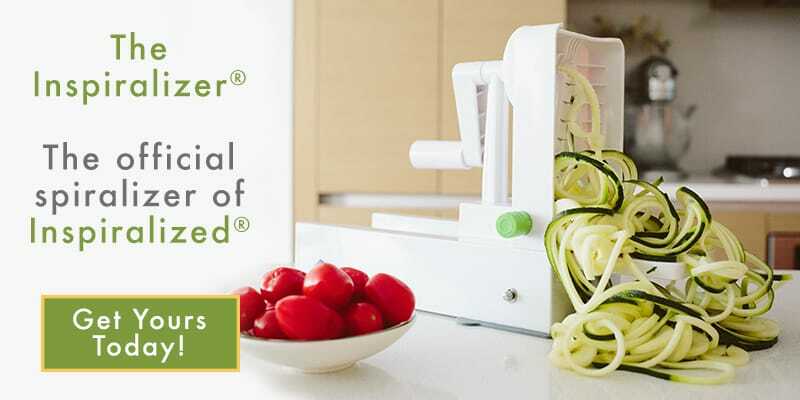 Challenge yourself in the kitchen – while having fun and inventing your own #inspiralized versions of your favorites! 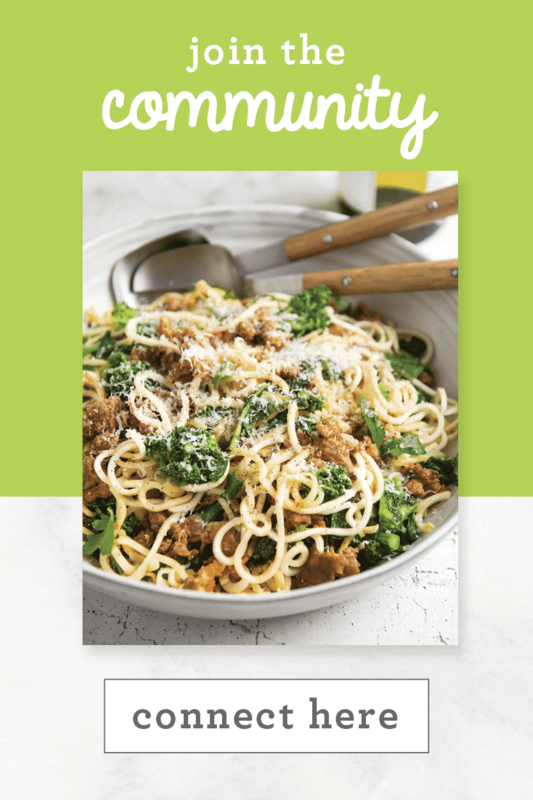 It can be a pasta recipe from a cookbook that you love, an old family recipe – anything! Just #makeitinspiralized! I’ll be reposting my favorite photos on our social media channels and even featuring some of them in weekly roundups on the blog! 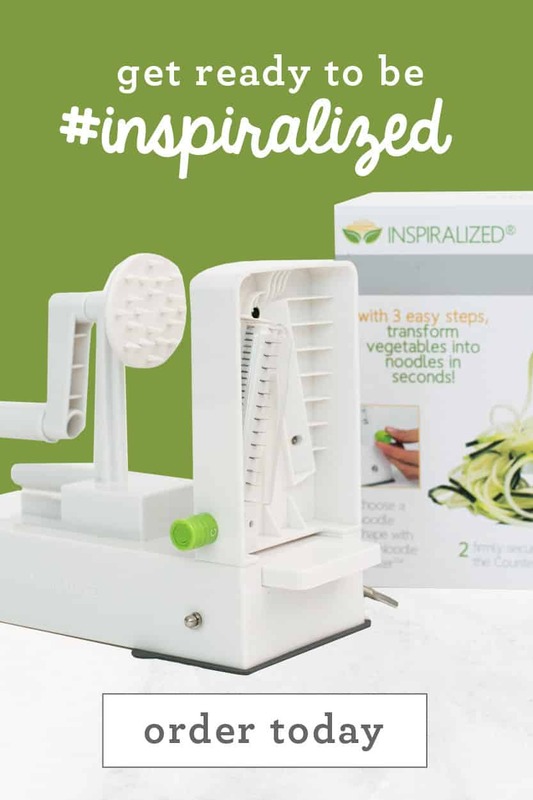 I want to see what you’re making and how you #makeitinspiralized! 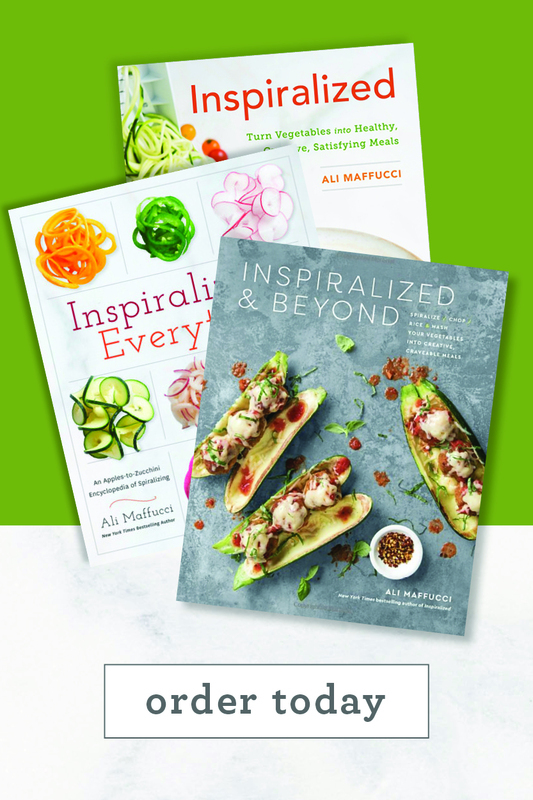 There will even be signed cookbook giveaways, Inspiralizer giveaways and other fun incentives to get you in the kitchen and spiralizing! Most importantly, have fun! I can’t wait to see what you whip up! I’ll be doing the same on @Inspiralized, so follow along. 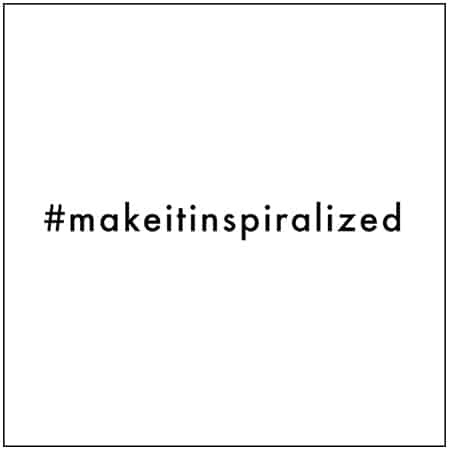 So tag your creative dishes #makeitinspiralized and you may get a shoutout from us! Preheat the oven to 425 degrees. Line a baking sheet with parchment paper and place the salmon on top and season with salt and pepper. Prepare the salmon. Whisk together the vinegar, ginger, honey and oil. Pour half over each salmon filet. Roast for 15 minutes or until cooked through. 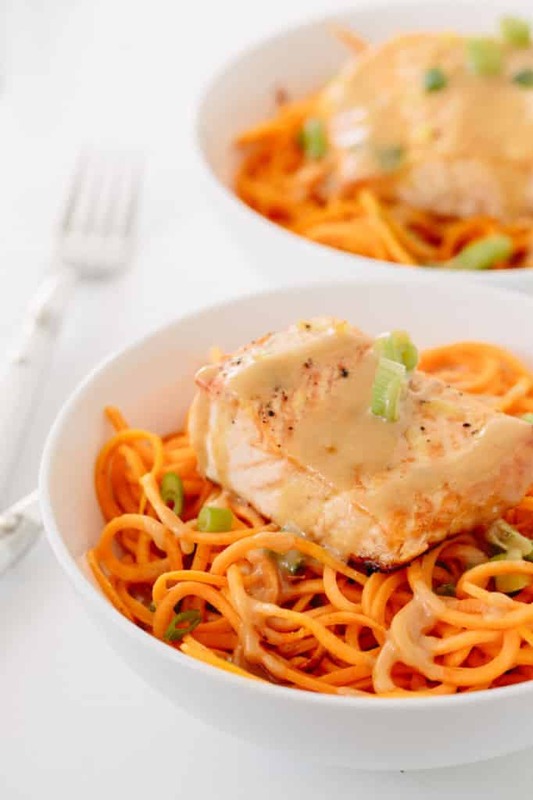 While salmon roasts, place all of the ingredients for the dressing into a bowl and whisk together until combined (or use a food processor.) If too thick, add water to thin out. Taste and adjust to your preference. Set aside. 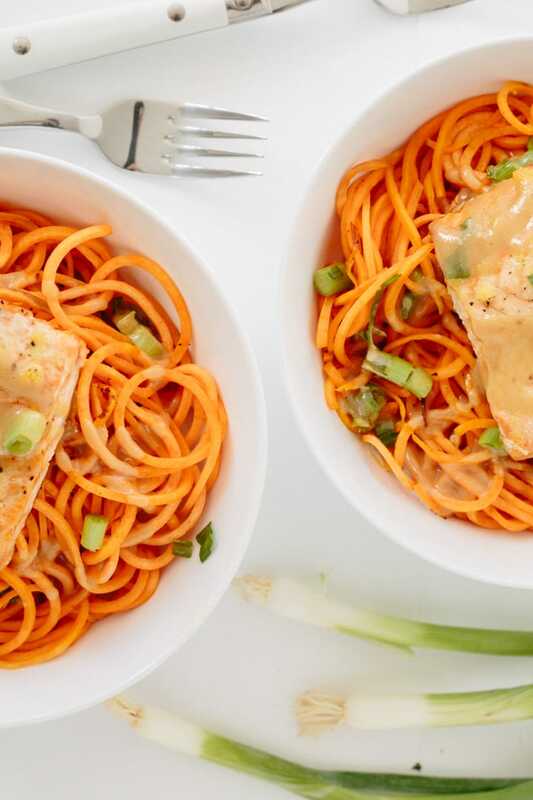 Place the sweet potato noodles into two bowls and top with roasted salmon. Drizzle with miso dressing and garnish with remaining scallions. This looks really good! But since I eat a Keto/low carb high fat way, I would substitute a large rutabaga for the sweet potato and sugar free maple syrup and honey for the full sugar ones. Anything with sweet potato is my kind of recipe! Love the challenge, I need to start getting creative. I signed up for your Newsletter but did not receive a Starter Guide. I just posted my version of spaghetti and meatballs with a pesto tomato sauce! I would LOVE LOVE to be featured!!! My insta is my full name (email) !! I made this for dinner tonight. The most difficult part was taking everything out of the pantry. I've said on other recipes, that whenever I make something from your blog, my husband always says, "I can't wait until you make this again sometime." He said it again tonight! Thank you again. Love that, so happy to hear it!! Hi Ali- 2 quick questions. If I omit the miso do I double the amount of tahini? OR can I use coconut aminos instead of the miso? Did you ever get answer to this? GREAT flavors and so easy to put together. Most of the time my initial prep time takes longer the first time around. So I am trying to make as many things ahead of time so that when it actually comes to meal time I'm not taking as long. For this recipe, Ali how far in advance do you recommend we can prepare the miso dressing as well as the sauce that goes over the salmon? Based on your tips, I know I can spiralize the sweet potatoe 2 days in advance ( (sealed in a bowl with ice water). I made this recipe tonight and it was a huge hit! My husband said he wasn't excited about eating salmon, but even he said this dish was delicious. Thank you! Made this last night and my 8 year old and I scarfed it up! It was really tasty and well-balanced. I substituted peanut butter for tahini since I discovered to my chagrin that the jar had expired in 2014. It worked fine, I'm sure any nut butter would work here. Thank you for another great recipe! I just made this recipe. It is reeeeeally good!! I only had parsley on hand instead of green onions so used that instead. Also, I added lemon to the salmon because my husband seems to think you can't have one without the other. Congratulations on the HSN slot! Thank you so much for your support! And we're so glad you liked the dish!! If I need to omit the miso, would I double the tahini or use something else instead of the miso?